Inexpensive Custom Business Card Magnets in Bulk with Full Color Imprint. 20 mil., 25 mil. or 30 mil. thick. Promotional, Budget Prices and quality in the USA and Canada. Square or Rounded Corners. FREE SETUP CHARGE! 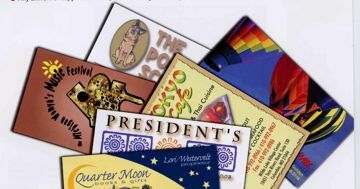 Custom printed Magnetic Business Cards -Business Card Magnets at wholesale prices. Use as many imprint colors as you wish, or even imprint a color photo. Business Card Magnets are one product that keeps selling long after the others have been tossed away and forgotten. Business card magnets are an effective and low cost way to attract your customers. Personalized with your services and your contact information in full-color, business cards magnets are a proven marketing tool for keeping your message in front of your clients . Budget Prices in USA and Canada for high quality business card magnets wholesale. Free artwork design. We will send you a proof for your approval before production. US clients pay no taxes. Stock designs for many professions or occupations are available: contact us. Unit prices below include your full color custom imprint, that is, unlimited number of imprint colors and/or a color photo. Less Than Minimum: absolute minimum quantity is 500: please add $45.00 LTM (Less Than Minimum Charge). Estimated Production: 5-10 days after art approval; Rush Production is available: contact us. Business Card Magnets - Magnetic Business Cards are perfect for medical care professionals, dentists, service contractors, schools, pet care professionals, computer services, real estate professionals, insurance agents, restaurants, pest control services, heating & cooling services and any telephone ordering business. Shape: Square Corners or Rounded Corners: same price! Please specify. Thickness: 20 mil. (0.020 in), 25 mil. (0.025 in.) or 30 mil. (0.030 in).